What’s the room in the home most visited during a normal day? You guessed it — the bathroom! As a focal part of the home, it makes sense to take a critical eye to your bathroom for comfort, style, water efficiency and energy efficiency. During Energy Awareness Month, Mansfield Plumbing has some tips to share! For style, check out the Affordable Style Designer Series suite collection from Mansfield that provides coordinated tubs, toilets and sinks. 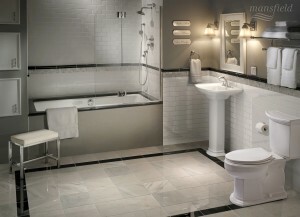 And for comfort, nothing beats SmartHeight toilets that meet ADA requirements. These “tall toilets” make it easier to sit and stand up, especially for taller people or those with special needs. For water efficiency, WaterSense rated toilets with 1.28 gallons per flush (Gpf) or lower help save water each time the toilet is used. These powerful low water use toilets are designed to remove waste yet can save on the use of water. When it comes time to look at energy efficiency in the bathroom, start with your lighting. Many bathrooms have several light fixtures above the mirror near the sink. Replacing those light bulbs with ENERGY STAR qualified bulbs is a big step toward saving energy. Making sure that the lights and fan are turned off when exiting the bathroom can also help save on energy bills in the home.